Snow running is a small but steadily growing sport which as the name suggests, is basically running on a snowy surface. It came about through runners wanting to continue exercising and racing throughout the winter months, when running trials were covered in snow. Compared to other winter sports like skiing and snowboarding, snow running is very cheap. Snowshoes cost less than skis or snowboards, with prices starting at about £40 for low-end snowshoes and better quality specialist models costing up to £100.There is also no need to use mechanical uplift with snowshoeing, meaning snow runners are free of ski resort infrastructure and don’t need to buy a lift pass. Instead they can practise snow running anywhere with snow, be it a local park, snow covered lake or forest trial. Another advantage of snow running over other winter sports is that it’s very easy to learn. Anyone who can run on snow-less ground, will find snow running very easy. This makes it a good activity for all ages. The modern running snowshoe is made of aircraft grade lightweight metals such as aluminum or titanium and weighs less than 2.5lbs. These small, light snowshoes are comfortable and allow a lot of maneuverability, and are not clumsy or bulky like traditional snowshoes. Running snowshoes have adjustable bindings that accommodate almost any foot length and width, and can be used with regular running shoes. 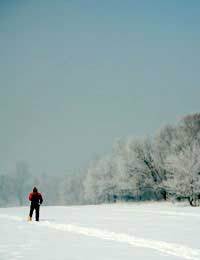 Running on snow can be compared to running in sand in terms of the energy required to do it. Therefore, snow running is an excellent calorie burning activity, which can use up 500-1000 calories per hour, depending on conditions and distance covered. Even though there is snow on the ground and the air is crisp and cold, the strenuous nature of snow running will mean that you quickly work up a sweat. Therefore, it is important to dress in layers and wear light thermal clothing that quickly wicks away sweat. For your hands, a pair of lightweight gloves are recommended and it’s a good idea to carry a hat. If you are covering longer distances away from shelter, it is advisable to carry extra layers in case the weather turns bad and you get caught out in a storm. Though many snow runners do it purely for fun, there is a growing circuit of organised snow running races. Race lengths vary from short 100m sprints, to long gruelling events of 100km. Snow running is also a part of other multi-sport events and adventure races and is part of the Arctic winter games. As an organised sport, snow running is relatively new, but there are internationally recognised bodies in the USA, Europe, Japan and other skiing nations. Some races enforce a minimum fixed snow shoe size, to ensure a level playing field is maintained. This can vary from race to race, so be sure to check the application details before turning up. Snow running is a great way to get outside during the long winter months and get some aerobic exercise whist enjoying beautiful scenery at the same time.